For all the fuss made around the launch of Windows 8 and Windows Phone 8 it didn’t take the more level-headed among us too long to notice the ongoing lack of any news on Windows Phone 7.8. Windows Phone 7.8 is set to launch in early 2013, Chinese blog winp.cn has been handed a slide said to be from a Nokia presentation kit, which reveals a few more potential features of Windows Phone 7.8. The update for existing Windows Phone 7 users will bring no notable features other than a new home screen, with support for three tile sizes. According to the sheet, Internet Explorer 9 will be patched with security updates, and users will be able to create ringtones out of MP3 files on the device. In addition, Bing photos will be a new repository for lockscreen images, which is a nice, small feature of Windows Phone 8. 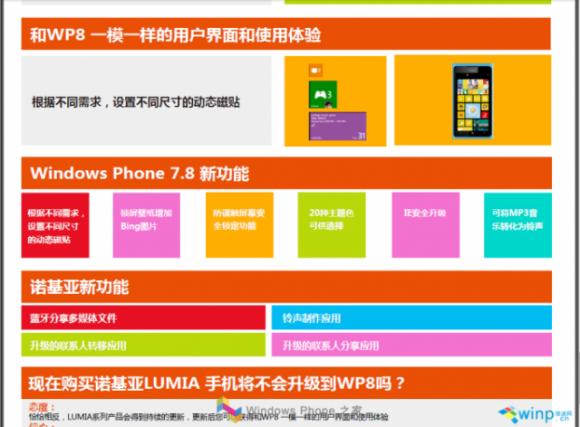 There will also be 20 colour themes altogether, matching the count of WP8. While we’re hoping that Microsoft will include a few more tangible features than these in the production release, we fear that Windows Phone 7.8 is little more than a pity update for those running legacy hardware. We’ll see in early 2013.